Description: Paradise found! 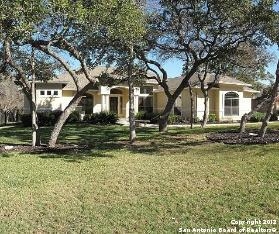 Stunning mediterranean 1 story with pool surrounded by beautiful oaks on .75 acre! Gorgeous wood floors! Stainless appliances, granite counters, 42 in cabinets, soaring ceilings, split bedroom plan, huge master retreat w/ his & her walk ins, elegant whirlpool bath, walk in shower w/decorative tile accents, 3 bedrooms plus study, oversized side entry 3 car garage, large utility w/ sink, 2 living areas, 2 dining, covered patio, deck, wrought iron fence, sprinkler system, gutters, wow! Hurry!